Christina Mahler, Principal Cellist of Tafelmusik, has been such a stalwart member of Tafelmusik that it seems unthinkable to think of attending concerts without seeing her onstage. 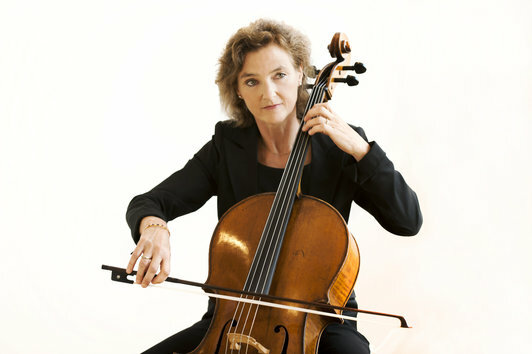 She joined Tafelmusik in 1981, two years after it was formed. As she prepares to move on to the next chapter of her life, I thought I’d lob her a few questions to talk about such a major career and lifestyle shift. It’s the end of an era – it was huge when your partner, Jeanne Lamon stepped down as Music Director in 2014 after 33 years at the helm. Now you’re retiring, after 38 years. What lead you to this momentous decision? I have always been extremely proud to be part of Tafelmusik and the job has suited me very well. Making this decision wasn’t done overnight. It slowly became clear that the time was right. My body let me know that playing over 100 concerts a year was becoming too much. If I want to play the cello for a long time to come, I need to balance life in a different, more considered way. It’s smart to listen to your body, and plan accordingly so you can keep playing well into the future. Do you have mixed feelings as this concert approaches? It’ll be the last you and Jeanne on stage together as Taflemusik colleagues. Think you’ll be emotional, or calm and collected? I absolutely will have mixed feelings … I have mixed feelings every day. Tafelmusik has been my life for 38 years and saying goodbye will be very emotional. There have been so many chapters within these 38 years, each with their own highlights, challenges, ups and downs. Preparing for this departure brings me closer to the earlier chapters and brings back lots of memories. It’s amazing how much we reminisce about something that started a long time ago, as we currently prepare for the end of it. Unfair question: what concert or event stands stand out the most for you? I realize you may not be able to list just one. Indeed I have to mention a few. In the ‘80s I loved our concerts with Anner Bijlsma, my cello guru. He had such an amazing gift of touching people’s hearts, whether in his playing or simply in his charismatic way of being. Our first performance of Haydn’s Creation in Irsee, Germany, was a huge event. We worked intensively to learn it, in this beautiful conference place in Bavaria, Germany, then performed it there and then we went right into recording it. Another highlight was the concert of our first memorized program, Alison Mackay’s Galileo Project. We rehearsed it in Banff where we gave our first performance before taking it to Toronto. Having the chance to play both Haydn cello concertos with Tafelmusik were amazing opportunities for me. The series of concerts we played at the Bach Fest in Leipzig in 2014 were very moving. Seeing the changes in this important city, since the Berlin wall came down, made this an important experience. That’s a hell of a list. Is there a certain piece of music that you most strongly associate with Tafelmusik? Why? There isn’t really one piece that I associate with Tafelmusik. Bach’s orchestral pieces stand out, because Tafelmusik, with its own voice and aesthetic sense, plays Bach in a way that feels right to me. But I also like Tafelmusik’s approach to Italian and French music. It all has made me feel very at home. I’m glad your work has resonated deeply with you – and the audience picks up on that. Have you ever had a pre-concert or onstage mishap that required superfast reflexes to carry on with the show? Of course mishaps do happen from time to time. The most amazing experiences I have had was with Tafelmusik’s harpsichordist Charlotte Nediger. On a few occasions, a soloist or singer would skip a passage or a beat or two, Charlotte and I both jumped so fast at the same time that nobody noticed. Your audiences and fans associate you so strongly with the cello, they may forget you’d have plenty of interests outside of music. What will you spend your time doing after your last bow as Principal Cellist? After my last bow as core principal cellist in Tafelmusik, I hope to play concerts on a regular basis, some with Tafelmusik, other in chamber music settings, some solo rep. I also want to continue my hobby of making and painting ceramics, painting and drawing in general, spending more time outdoors etc., yoga, pilates, join a choir perhaps? So many possibilities. I am very excited about having more time. This sounds like a terrific plan, and I hope you’re as fulfilled pursuing these things as you were performing with Tafelmusik. Christina, thank you SO much for chatting with me – I know you’re crazy-busy and I know our readers will love reading this. Also, on behalf of The New Classical FM, I wish you all the good things after your last concert with Tafelmusik! Christina Mahler’s last performances are with Music Director Emerita Jeanne Lamon, who returns to direct “The Hunt: Mozart & Haydn”, takes place April 25 to 30. These are also Christina’s last concerts of the 19/20 season, though she will return for the free concerts as part of the Tafelmusik Baroque Summer Festival in June.